THE WORLD IS FULL OF ZOMBIES, THIS WORLD IS 'ZOMBIEWORLD'. The end is here! Well not quite but soon you can watch a possible ending in 'ZOMBIEWORLD'. Satisfy your thirst for all things zombie as they take you back in time to the biblical rise of the living dead: before running, screaming from continent to continent as reports of zombie invasions cross the world! 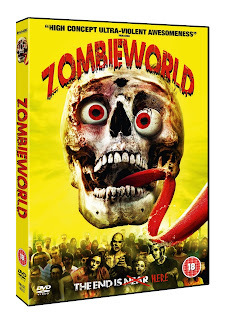 With ultra-violence, gallons of gore and heaps of bloody fun, 'ZOMBIEWORLD' is like nothing you've seen before. This ravenous collection of deadly tales takes over your DVD player with a running time of 96 minutes on 8th of June 2015 courtesy of Image Entertainment. Special Features on the DVD include a 'Marathon Apocalypse'.